Normally, the chambers of the heart (atria and ventricles) contract in a coordinated manner. The contractions are caused by an electrical signal that begins in an area of the heart called the sinoatrial node (also called the sinus node or SA node). The signal moves through the upper heart chambers (the atria) and tells the atria to contract. After this, the signal moves down in the heart and tells the lower chambers (the ventricles) to contract. The rapid heart rate from PSVT may start with events that occur in areas of the heart above the lower chambers (ventricles). There are a number of specific causes of PSVT. It can develop when doses of the heart medicine, digitalis, are too high. It can also occur with a condition known as Wolff-Parkinson-White syndrome, which is most often seen in young people and infants. A physical exam during a PSVT episode will show a rapid heart rate. It may also show forceful pulses in the neck. The heart rate may be over 100, and even more than 250 beats per minute (bpm). In children, the heart rate tends to be very high. There may be signs of poor blood circulation such as lightheadedness. Between episodes of PSVT, the heart rate is normal (60 to 100 bpm). An ECG during symptoms shows PSVT. An electrophysiology study (EPS) may be needed for an accurate diagnosis and to find the best treatment. 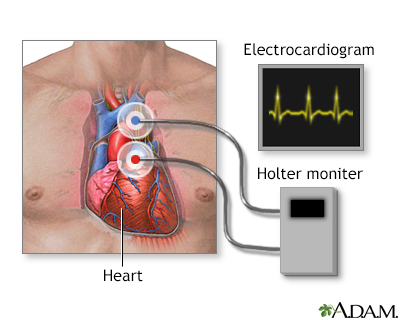 Because PSVT comes and goes, to diagnose it people may need to wear a 24-hour Holter monitor. For longer periods of time, another tape of the rhythm recording device may be used. PSVT that occurs only once in a while may not need treatment if you don't have symptoms or other heart problems. Valsalva maneuver. To do this, you hold your breath and strain, as if you were trying to have a bowel movement. Coughing while sitting with your upper body bent forward. You should avoid smoking, caffeine, alcohol, and illicit drugs. Cardioversion is a method to bring an abnormal heart rhythm back to normal. PSVT is generally not life threatening. If other heart disorders are present, it can lead to congestive heart failure or angina. You have a sensation that your heart is beating quickly and the symptoms do not end on their own in a few minutes. You have a history of PSVT and an episode does not go away with the Valsalva maneuver or by coughing. You have other symptoms with the rapid heart rate. It is especially important to call if you also have other heart problems. Olgin JE, Zipes DP. Supraventricular arrhythmias. In: Zipes DP, Libby P, Bonow RO, Mann DL, Tomaselli GF, Braunwald E, eds. Braunwald's Heart Disease: A Textbook of Cardiovascular Medicine. 11th ed. Philadelphia, PA: Elsevier; 2019:chap 37. Page RL, Joglar JA, Caldwell MA, et al. 2015 ACC/AHA/ HRS guideline for the management of adult patients with supraventricular tachycardia: a report of the American College of Cardiology/American Heart Association Task Force on Clinical Practice Guidelines and the Heart Rhythm Society. Circulation. 2016;133(14);e471-e505. PMID: 26399662 www.ncbi.nlm.nih.gov/pubmed/26399662.